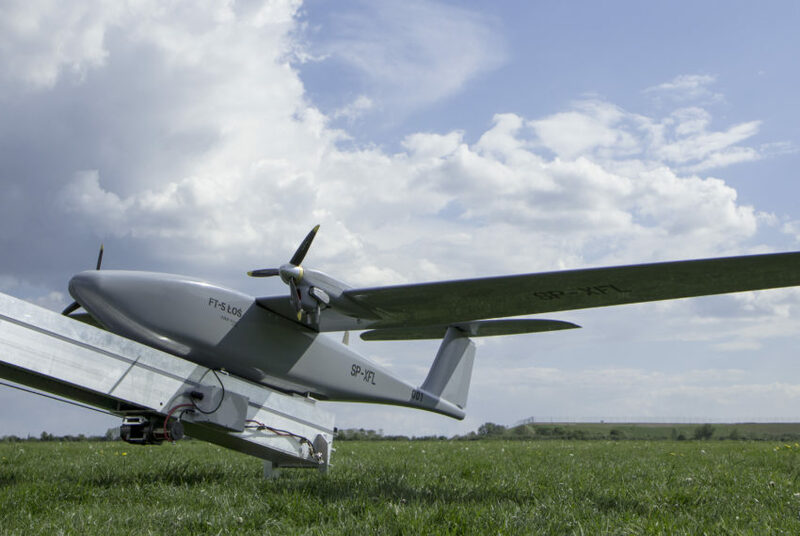 A short-range tactical unmanned aerial platform intended for the execution of missions requiring reliability and prolonged flight endurance. The standard includes a surveillance payload with a daylight and thermal imaging camera, and can be modified depending on the specific needs and intended use. The Łoś can stay airborne for 12 hours. Real-time data transmission during flight, preserving high image quality. The Łoś (eng. the Moose) is a T-tail, highwing aircraft with two high-efficiency combustion engines which feature integrated generators supplying power to on-board equipment. In its standard configuration, it has a daylight and thermal imaging surveillance payload. The Łoś also has light, precision-guided armament carrying capacity, circulating ammunition, COMINT/ELINT airborne radioelectronic reconnaissance systems, and contamination sensors. The modular construction allows for easy transport and is ready-to-fly in 30 minutes. There is a portable, ergonomic launch ramp adapted for trailer carriage. The applied technology provides for fully autonomous takeoff and landing. Designed to land in glide mode on rough terrain without having to use airport infrastructure. Depending on the intended use, the fitout can be modified to the Client’s individual needs and requirements. Łoś was recognised by experts at the 2016 MSPO International Defence Industry Exhibition where it received the prestigious DEFENDER award. Increased reliability and safety due to 2 combustion engines. Radio communication range up to 180 km LOS. Simple operation, logistics and handling. Modular design for easy transport of disassembled system into modular components. Sensor and fitout modification possible. Payloads of up to 30 kg, inclusive of fuel. Long-range surveillance and target tracking capability. Precision laser distance-measurement sensors to object. Human body detection from 5 km, identification from 3 km. Flight path pre-programming with capacity for flight path changes while airborne. Control from two different GCSs. Digital connection for bidirectional transmission of flight control parameters, data and video imaging. Real-time video signal reception and telemetry data transmission to GCS (via transmitting/receiving station). Communication in frequency band: NATO band C.
Control can be taken over by distant station, increasing its practical operational range. Fully automatic launch and landing in confined spaces of 50 m x 50 m.
Launch and landing on difficult terrain. Landing accuracy of 50 m.
Easy launch ramp assembly (enclosed or towed behind vehicle). Pre-flight setup time max. 30 min. Autonomous flight along pre-defined route, possible route changes while airborne. Flight along pre-defined route, even out of radio range. Flight to destination point according to set coordinates. Flight in direction indicated by surveillance payload. Manual flight control from operator?s workstation. Automatic lock of selected object in frame. Automatic escorting (with mobile transmitting/receiving station). Determination of coordinates of observed objects and relay of coordinates to Mortar Fire Control System (MFCS) or Battlefield Management System (BMS). Automatic retraction to position of last radio contact or automatic landing in pre-defined point upon communication loss. In-flight modification of mission parameters. Advanced flight safety enhancement systems. Takeoff from mobile launch ramp. Safe landing system due to protection system of surveillance payload. Glide mode landing with reduced approach after landing capability. FT-5 Łoś Unmanned Aerial Platform. GCS with optional second GCS which can take over the control. GCS can also be adapted for mounting on vehicles. Training simulator with the capacity to synthesize videos.